A blog about what it's truly like to live in a tiny NYC apartment... and things that make it tolerable! 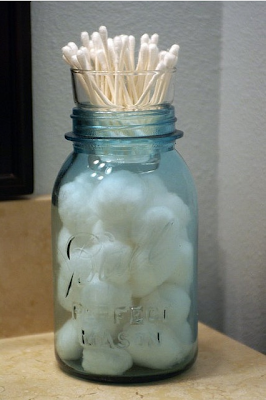 I love finding cute, easy DIY bathroom space savers. Since I unfortunately have an addiction to beauty products, my bathroom space tends to be on the clutter-y side. Let's say I find a really awesome product suggested in Lucky magazine, here is my usual routine: I visit Sephora 5 times to look at it, go back and forth wether I NEED it, finally decide it NEEDS to live in my bathroom and will obviously be life changing, and I plunk down the dough for whatever I've deemed appropriate to add to my roster. Then after about 2 weeks, I'm like "Super expensive mascara, blech, you are no longer working! I need a new one!! "And the cycle begins again. Little changes like adding the above storage jar make the bathroom a more aesthetic and simple space. It is especially conducive to makeup experiments gone awry or just easily letting you know if you have enough cotton balls on hand to take off the 5 pounds of eye make up you used for that fun wedding you went to last weekend. Who would have thought that an eggplant-based-smoky-eye-with-sparkly-glitter would turn into 25 black cotton balls thrown haphazardly into the trash at the end of the evening? At least they made it into the basket.